School Sight Program - The Lions Clubs of Saskatoon contribute funds to the school sight program, which ensures students-in-need in Saskatoon schools can access eyeglasses. Lions receive a contribution from the Saskatoon Community Foundation to administer the program and since 2014, 195 pairs of glasses have been distributed to Saskatoon students. ​​Used Eye Glasses- Our Club picks up used eye glasses at various optometric offices and other retail outlets. These are shipped to Calgary where they are graded and shipped to third world countries to be given out to the poor people (see www.clerc.ca). ​Campaign Sight First Two- This was a 3 year Lions Clubs International program that ended June 2008 and raised over $200 million US dollars to be used in getting rid of preventable blindness such as river blindness and reversible blindness such as cataracts. Our Club has pledged $6,000 to this campaign. Over the past few years, the Nutana Lions club has donated funds to the eyecare initiatives listed below. These donations would not have been possible without the generous support from Saskatoon and the surrounding area and all of the people that attend our fundraisers to support the work we do. $20,000 to the Saskatchewan Lions Eye Bank to support the purchase a new slit lamp that will be used in regular eye exams. $10,476 in 2017 for the School Sight Program. $10,000 to the Saskatoon City Hospital Foundation. $1500 annually to the Lions Clubs International Foundation to support Dog Guides. 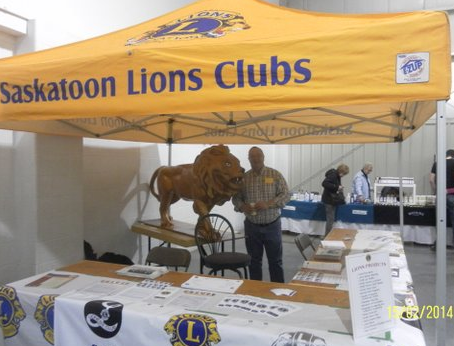 $2000 annually to the Saskatchewan Lions Eye Bank. Support for a Saskatoon Resident travelling to Toronto for major corrective eye surgery. $1000 annually to support the Western Blind Golf Tournament.